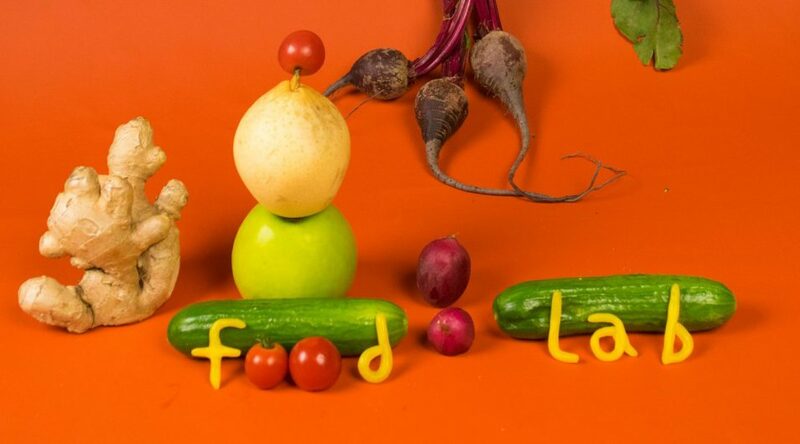 RISD Food Lab brings students together to collaborate on food-based projects. This story is part of a larger Back to School series focused on how design students are self-organizing to address the complexities, opportunities, and failures of our food system. While the Rhode Island School of Design (RISD) is home to programs of study for a variety of design disciplines including fashion, studio art, industrial design, and sculpture, students are now taking steps to produce work that crosses food with design. Raina Wellman, a graphic design student at RISD, was looking for an outlet for students to decompress and celebrate a love of food, when she decided to co-found a new club with fellow students, the RISD Food Lab. 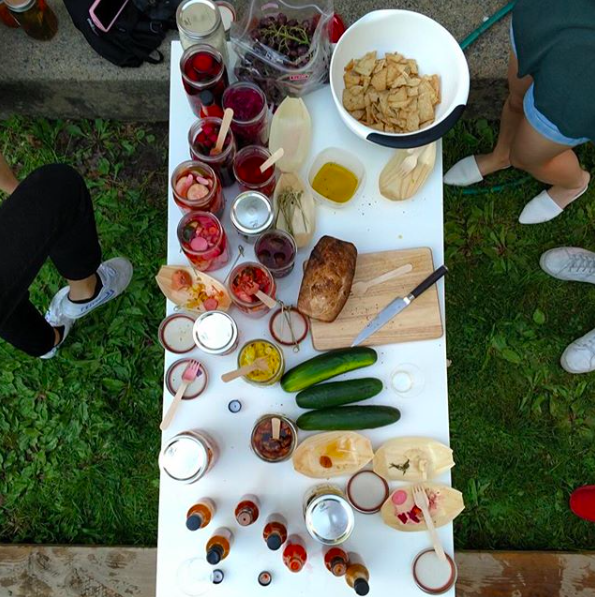 Launching earlier this year, RISD Food Lab includes students from all grades and academic studies, bringing them all together for workshops on topics like fermentation, celebratory tasting parties, lectures and collaborative demonstrations. 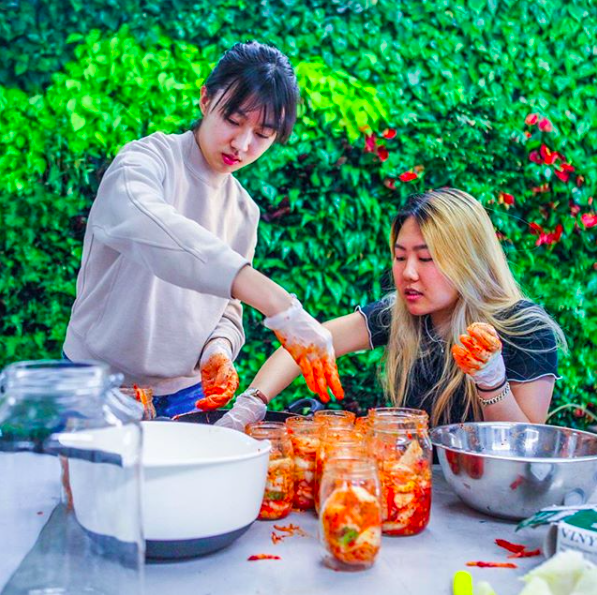 RISD Food Lab members make kimchi together. The introduction of a new food design club at RISD reflects the growing awareness of how these two seemingly disparate disciplines intersect. Clubs like RISD Food Lab signal an increasing interest in food studies at universities through non-academic outlets. Interdisciplinary organizations are especially key to discussing food systems of the future, as they bring together different perspectives and sources of knowledge to analyze food from all angles. RISD’s Food Lab is an opportunity for students to experiment and collaborate through the universal medium of food. A pickled cucumber made by members of the club. 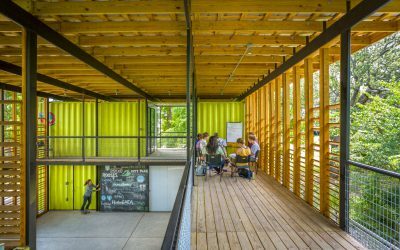 MOLD spoke to Wellman about why RISD students have started a club for experimenting with food as an expansion of their design practice and how other universities can develop similar resources. In what ways was food a culturally significant part of the community where you grew up? I was born and raised in New Mexico, primarily Santa Fe, which is a huge foodie town. Leaving home is always hard, because I miss the local cuisine. It’s difficult to find New Mexican food anywhere else. The smell of roasted green chile, enchiladas “Christmas” style, chilaquiles, spiciness in everything (including the apple pie)—that’s what home tastes like. Food has always been a big part of my life, particularly as a way to gather and create community. In Santa Fe, especially in the community my family is a part of, potlucks and dinner parties are a big thing. What artists and designers inspire the way you approach your work at RISD? I’m super inspired by the work of people like Sissel Tolaas, Christina Agipakis, Nathalie Jereminjinko, Alexandra Daisy Ginsberg. Club participants gather for a communal tasting. Why do you think the intersection of design and food is valuable, particularly for developing college courses in the future? I recently read about chef Peter Morgan-Jones who creates food for people with dysphagia in order to help restore the joy of eating. Food and design are always coming together, in plating, in the way that space can influence eating experiences, and in the cases of trendy foods like charcoal ice cream and unusual cocktails. 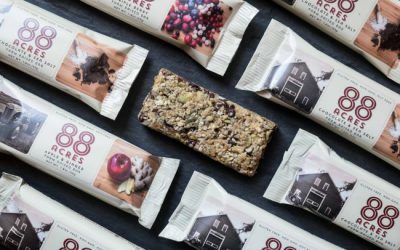 Additionally, branding/graphic design choices can completely influence consumers relationships with food products. What motivated you to start the club at RISD and why do you think this came about now for the first time at the school? The RISD student body actually has a pretty rich history of organizing community events that involve food. Because the school is such an intense environment, clubs often die out when their members graduate. I’m doing my best to combat that by getting a lot of teacher and widespread student support, but we’ll see. I think it’s really important for our school to have a club like this one. 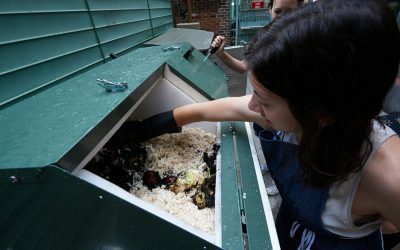 RISD Food Lab allows students to freely experiment with food. In making the club I was inspired by a past club I participated in when I was a freshman, the (now disbanded) Dinner Party Club. Their goal was to make meals and share them with friends and strangers. 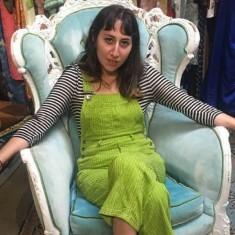 I thought it was a delightful way to create community, and it was a really organic, casual way to meet new people as a first semester freshman. That kind of opportunity is pretty rare, especially when you’re first starting school. Additionally, the class years and the departments tend to create pretty isolated groups. This year was kind of the perfect moment to start the food lab. RISD students are beginning to really take interest in food and experience design. It was lucky that we were able to find each other this spring and make real projects happen. Since my freshman year of college (2015-2016) I’d been dreaming about doing an extensive project using fermentation, but hadn’t been able to find a group of people that were as excited about the project and were prepared to put in the time. 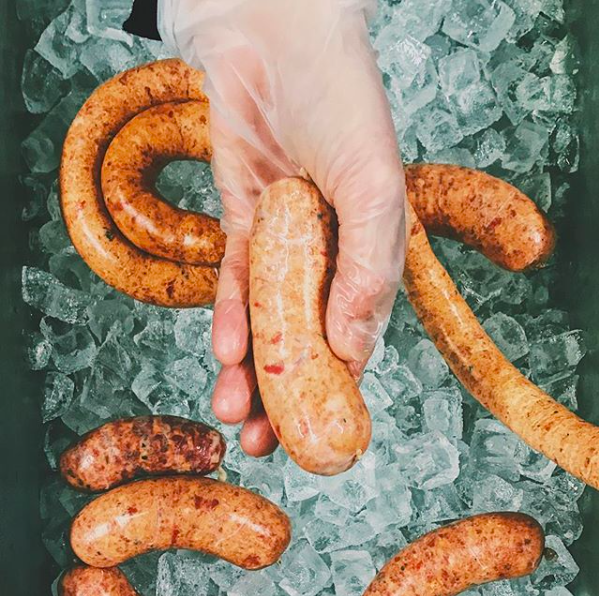 Members took a field trip to Pilotworks Providence to learn about sausage making. 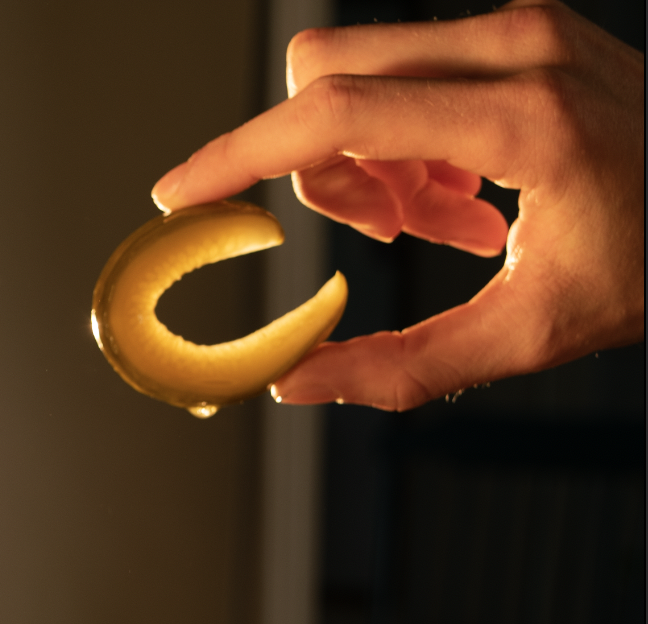 We’re witnessing the creation of more and more projects that highlight the connection between food and design – what do you think is different about the work you’re trying to achieve at RISD and what makes it important? What ends up making us stand out is our freedom of approach. We are a group of students supporting each other as we investigate a subset of art and design that isn’t typically offered as a course. We are also a group of students aiming to create a community space that can facilitate conversations about diet, class, race, culture, and the environment. We want to reinvent and investigate all the different ways that food is perceived and used, all while using design techniques to highlight the multisensory experience of eating. On another note, I felt like the (ongoing) process of branding the RISD food lab was really interesting. My intention, as the designer, was to create a sustainable brand identity system that allows future designers to make it their own. Too often, brand identity guides don’t allow designers to be clever and creative. By creating a few simple rules, I hope that the “brand” of the food lab will grow organically to best fit the mentality of the club as it evolves. 2017 Thought for Food Challenge Finalists Announced! This past year, I was lucky to find a group of undergraduate and graduate students who were focusing on food related projects for their senior theses. They had been meeting in the basement of the nature lab to discuss their projects and were considering doing workshops/community events. 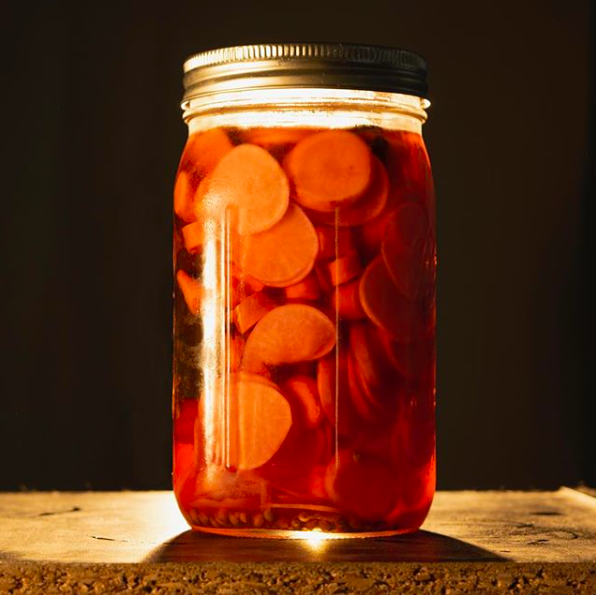 It was absolutely incredible working with them and many of them had fermentation specialties—Aki Barber taught us about sourdough, Maggie Coblentz taught us how to make kimchi, and Jonah Palmer taught us how to make fermented hot sauce. In collaboration with STEAM (Science Technology Engineering Art) we were able to put on a series of weekly fermentation workshops and eventually host a tasting event.